When you want to add the data line by line. When you want to import the data from a .csv file. When you add rows to your new SQL table that are the results of another SQL query. Note: This is going to be a practical tutorial, so I encourage you to do the coding part with me. Let’s get back to our test_results table that we created in the previous tutorial. Query the table once again! Now, we have 5 students. Easy as pie! INSERT INTO is the SQL keyword. test_results is the name of the table that we want to put the data into. VALUES is another SQL keyword. Then the actual data rows are coming one by one – each of them between parentheses and separated with commas. The field values are separated with commas. 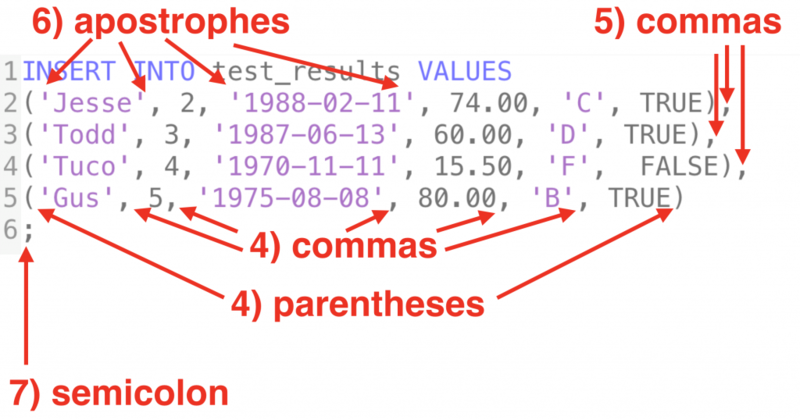 Watch out for the Text and Date data types because these have to go between apostrophes! And don’t forget the semicolon at the end of the whole statement! As we have discussed in the previous article, if you do changes in your database with an SQL manager tool (like pgadmin4 or SQL Workbench), you have to commit them. What does it mean? Learn more here. Note: If you turned auto-commit on or if you are in the command line and not in an SQL query tool, then you can skip this commit step. How to empty your table without deleting the table? You have already learned about the DROP TABLE SQL statement that deletes your SQL table. But very often you don’t want to delete your table (because you want to keep the structure of it), only clear that data. You can do this by using the TRUNCATE TABLE statement. This will delete all the rows that we have inserted in the table before; but it will keep the table itself. Don’t forget that you have to commit your changes! To be honest, this is a more common scenario than the first method I showed. As a data analyst you quite regularly get raw data sets in file formats, like Excel or .csv or .txt. You can import these data files using the COPY statement. COPY is the SQL keyword. FROM is another SQL keyword. Then you have to specify the filename and the location of the file that you want to copy the data from between apostrophes. And eventually you have to specify the field separator in your original file by typing DELIMITER and the field separator itself between apostrophes. So in this case ' ' means that the delimiter would be a space. STEP 1) First, you have to open your Terminal window and connect to your data server. This will create a .csv file called test_results.csv. STEP 3) Double-check your new file: cat test_results.csv. And find out the exact location of it by typing pwd. And boom, the data is copied from a .csv file into our SQL table. You can even query it from your SQL tool. Why we didn’t do the COPY in our SQL manager tool? Same reason: if you don’t have SUPERUSER privileges, you can’t run the COPY command from an SQL tool, only from the command line. If you follow the video that I linked in the previous point, you will be able to run the same COPY statement from pgadmin or SQL Workbench. 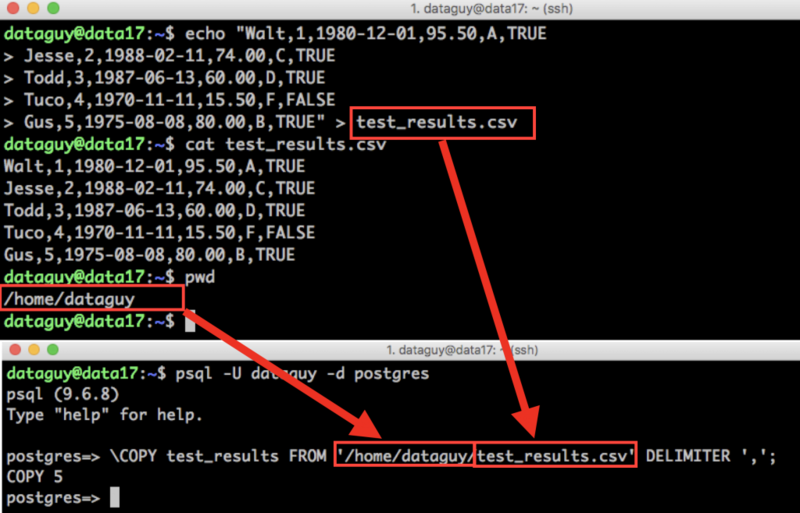 The '/home/dataguy/test_results.csv' is the location of the file and the name of the file, together. Again, we found out the location by using the pwd command in the right folder. 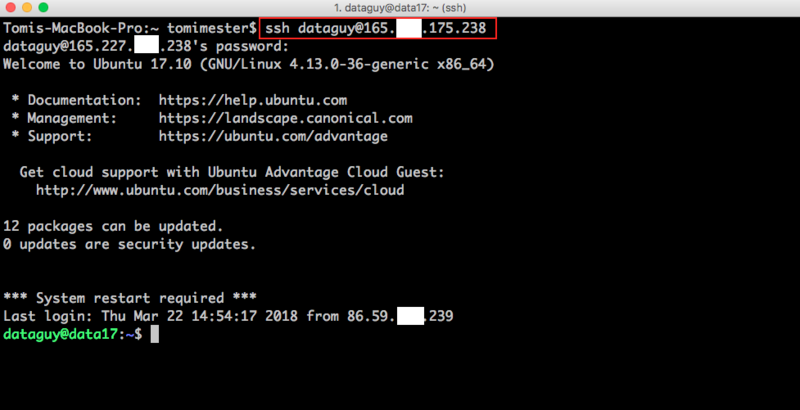 And finally: if you are not comfortable with these command line steps, read the first few articles from my Bash for Data Analytics article series. And boom, the data is copied from a csv file into our SQL table. Do you want to store the output of your SQL query? Not a problem… Maybe you want to save your daily KPIs that are calculated from SQL tables; or you want to have the cleaned version of a data set next to the original. In SQL, you can do that easily. Say we want to create a table where we want to store only the names from our test_results table. Use the INSERT INTO statement (that we learned in the “Data import method #1” section, at the beginning of this article), only instead of typing the values manually, put a SELECT statement at the end of the query. 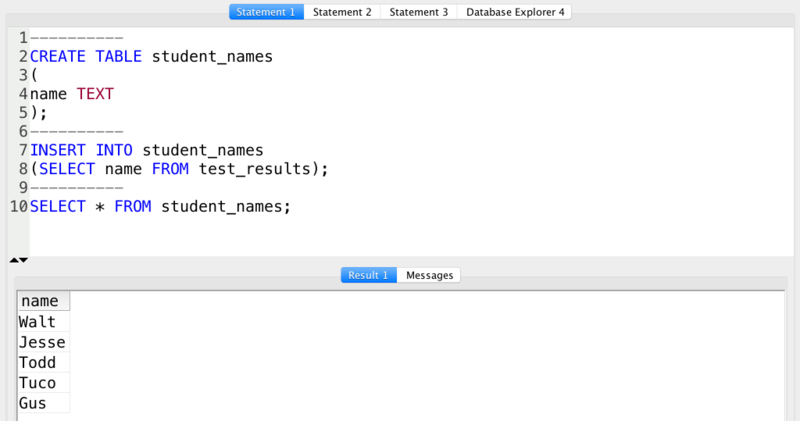 This SQL statement put the result of the subquery between parentheses into the freshly created student_names table. This table will store only one value: the average test result… but if we also had math test results, biology test results and physics test results in other SQL tables, this test_averages table would be the perfect place to collect the different averages. This was the third – slightly more advanced – way to import your data into an SQL table. Now go ahead and test these methods on your own data set! Now, you know how to create new tables in SQL and how to import data into them!